It is holiday season (what! NO!) so life is hectic so expect a dramatic drop in posts. I hope that won’t be the case, but it has been several weeks since my last post so the forecast isn’t favorable. To be fair, there were quite a few things going on in my life but I digress. I am back with another hit. I admit, I cheated slightly with this post. I had a glass of the wine the night before, but the candy inspiration came from a friend. Lazy and not feeling up to thinking about pairing, I asked someone for suggestions and she said Reese’s Peanut Butter Cups. Now, before you lose your hats, I didn’t do Reese’s since I knew the wine would just drown it out. 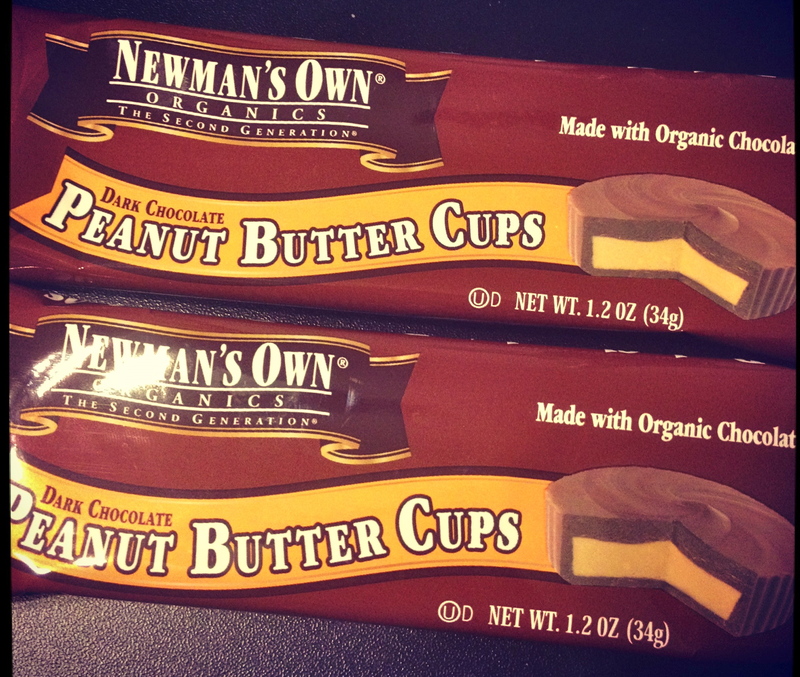 Instead I picked Newman’s Own Dark Chocolate Peanut Butter Cups. The chocolate is richer and the cups are stronger. 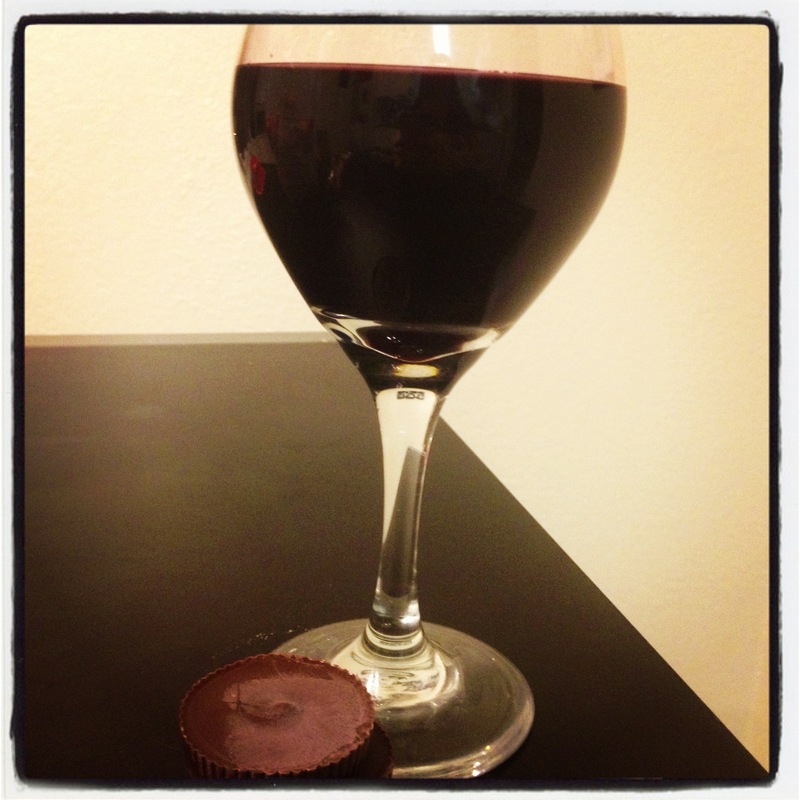 I love Reese’s, don’t misunderstand, but I did not think it would go well with a cabernet sauvignon. I would like to try it with a chardonnay potentially. This label is so EDGY right? I already explained my reasoning somewhat, but I will go into further detail. The reason I chose Newsman’s over Reese’s is due to a combination of texture and flavor. Newman’s peanut butter cups are firm and leave little residue behind. This gives a better tasting experience. It’s also a matter of chocolate quality. Milk chocolate and a peppery cab just don’t mix well, especially Reese’s chocolate. It is flimsy and too sweet (and THIS is perfectly fine). There is also a lot of the peanut butter filling and it is very sugary. I would like to try them with a dry chardonnay which can compliment the sweet chocolate and peanut butter. That was a long explanation. Let’s get to the tasting! EB|GB has blackberry notes that hit the pallete sharply, ending with a smooth finish. The flavors tingle slightly on the tongue with a hint of coffee. The peanut butter cups have a thick chocolate exterior with smooth and nutty peanut butter underneath. This pairing is pleasant. Dark chocolate and red wine is usually a safe bet, but the addition of peanut butter is a challenge. It’s pleasant, but the wine looses it’s smooth finish. Oddly, the peanut butter coats the mouth with a strange after taste. The berry wine flavors add a richness to the wine although the tartness undermines it slightly. It is not a complete home run, but it is delicious. Unfortunately I took a lot of negative notes. Woops. I think I will go ahead and do the Reese’s pairing for the next post. Why not? I have nothing to lose but my sterling reputation. Posted in Cabernet Sauvignon and tagged Cabernet Sauvignon, Candy, Newman's Own, Peanut Butter Cups, wine pairing. Bookmark the permalink. 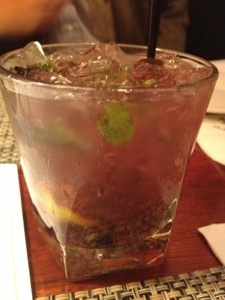 For now here is a pic of a blueberry mojito. On first sip, it tasted like a regular mojito but after a moment the blueberry bursts on your tongue. As the sweet and tart pops on your tongue the mint rushes on your palette. Posted in Uncategorized and tagged Blueberry, mojito. Bookmark the permalink.